Spanish researchers are now one step closer to creating bone and cartilage for patients using 3D printing, after the tissues were recently synthesized using the technology for the first time. This sees Spain keeping pace with developments we’ve previously reported on in various other places around the world, where 3D bio-printing is beginning to move out of the laboratory and become implemented more and more for transplants and other important surgical procedures. The breakthrough was made by scientists and engineers at the Universidad Complutense de Madrid, in collaboration with the Spanish Council for Scientific Research (CSIC). Research in Spain has been progressing well in the bio-printing field recently, with 3D printed human skin tissue having already been mastered at the start of this year. 3D printed bone tissue should prove to be even more useful, particularly as a way of treating osteoporosis and other degenerative conditions, and it will also lessen the need to use animals as laboratory test subjects. The bone and cartilage tissue bio-printing process that has been pioneered makes use of a 3D printed grid, made of polycaprolactone (PCL). 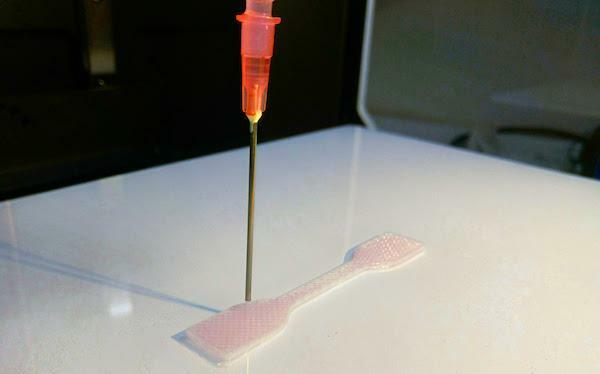 After being extracted from existing tissue, a patient’s cells can be implanted in this grid with a needle that is attatched to the printer head. These cells then start to reproduce in the PCL grid, forming the required tissue. There are two ways this tissue can be implanted in the patient. One is to place the grid with the patient’s cells in the fracture of the bone or cartilage, so that they regenerate inside the body. The other is based on the creation of an ecosystem in the laboratory for the cells to reconstruct the tissue, which is then implanted in the patient. Using the patient’s own cells for the 3D printed tissue means that they are much less likely to be rejected by the host body, and existing metal prosthetics will be gradually phased out and replaced as the bio-printing process becomes properly implemented in medical treatment.